Open Houses: Best Practice or Not? The decision to sell your home, the place you have lived for years and where you created memories, is no easy decision. Still, the process of selling your home should be as smooth as possible. Proper research, pricing and marketing will produce a sale in the shortest amount of time possible, for the highest price, and the least amount of inconvenience. Often, amid all the other marketing pieces and systems that agents have at their disposal, an open house will be suggested. However, according to the latest statistics, open houses may not be the best way to sell a home. In fact, the National Association of REALTORS® (NAR) reports that only 9% of all buyers in 2014 found the home they purchased via a yard sign or open house sign. So, let’s put these two stats together: Only 9% of buyers found their home with a yard sign or open house sign and nearly 50% of agents suggest the open house for marketing a seller’s home. Why the discrepancy? 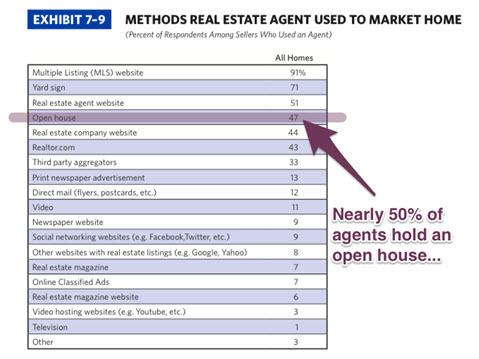 In my personal opinion, agents continue holding open houses because they generate future business for the agent in potential buyers, sellers and localized branding. (Disclosure: about 75% of my listings in the last two years have sold as a direct result of my open house marketing system.) Still, I believe we’re experiencing a shift in thought about open houses for two reasons: conversations with future sellers and agent disgruntlement. For the last few years, more than a handful of sellers have expressed to me, without prompting, their disdain for the open house. They’ve seen how the process simply favors the agent holding the home open, not the sellers, and have decided that they don’t want that for their selling experience. Agents, for their part, are becoming less excited about open houses, because so many consumers are attending the open houses either with their agent, or already represented by an agent. And now, a possible solution by way of a story: A past client engaged my services to sell their home. They had a newborn, and two toddlers, so they were beginning to bust out of the seams of their 1,050-square-foot ranch. We settled on a list price, and a date to shoot the photos and video of their home. We even chose a list date for their home to become live in the MLS. And then the client posed a question that has since transformed how I list homes. A light bulb went off in my mind and here is exactly what we did: We captured all the media (photos and video) for their home, created a single property website to answer as many of the potential buyer’s questions as possible, and launched the listing active on a Wednesday. We did not allow any showings on the property until the open house that was held the following Sunday, from 2-4 p.m. Not one showing! At this open house, we had 140 attendees. Before I left the open house, I had four offers in hand and an additional five threats of offers to materialize. By Monday evening, my sellers had 17 offers to review and finally settled on an offer that sold the home for 12% more than the list price. Moral of the story: If you are going to allow your home to be held open, make sure that it’s a part of the marketing strategy for your home and that there is a clear plan of attack on how to maximize the impact of your open house to cause your home to be sold. TODD WALLER is a REALTOR® with Berkshire Hathaway HomeServices Snyder & Company, REALTORS® in Ann Arbor, MI. Visit his website www.toddwaller.com and connect with him on Twitter, Facebook and LinkedIn. One response to Open Houses: Best Practice or Not?